Japanese Episode DP 157: "Fukamaru! I Got One!!" American Episode 1252: "Gotta Get a Gible!" Satoshi and his friends arrive at a new town and spot the Fukamaru they had met back at Tatsu-baasan's place. 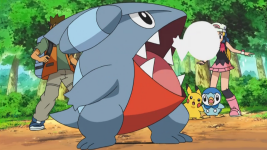 Satoshi deduces that the land shark pokemon wants to join them on their journey, so he tries to capture it. The attempt fails, but before Satoshi can try again, a Junsa arrives on the scene and tells our heroes that Fukamaru is responsible for destroying structures throughout the city! The pokemon runs away after Satoshi scolds it, so the others run after it. The chase is cut short, however, when Satoshi's rival Jun rides in on a bicycle and crashes into him! After getting everyone up to date with the status of his journey, Jun spots the wild Fukamaru and tries to capture it for himself. Jun's Empärt attacks and inadvertently sends Fukamaru flying off over a cliff, so Satoshi rushes off to rescue the pokemon. As soon as Fukamaru is safe, the Rocket-Dan appear and steal it from him! A short battle later, Satoshi rescues Fukamaru and earns its trust enough to be allowed to catch it in a Monster Ball! Jun catches up with Satoshi and challenges him and his new pokemon to a battle to see which one of them is stronger. Satoshi accepts, and before long Satoshi's Fukamaru faces Jun's Empärt. Unfortunately, Satoshi loses the battle due to his pokemon ignoring his commands and doing whatever it wants. The young trainer is happy, however, because he's found a new friend in Fukamaru. You know, I never really understood fans' obsession with Fukamaru. Online message boards are filled with people acting like it's the freakin' Jesus of pokemon and that its capture signals the beginning of some new chapter in Satoshi's journey when really, it's just another pokemon. It'll have its wins and losses before eventually getting booted off the team, just like every other pokemon not named Pikachu. I also see people praising how "funny" it is, but I just don't see it. It's personality is its lack of a personality, and every time I see at its blank, expressionless face, I'm reminded of that retarded horse from Family Guy. It has that thing where it bites people's heads, but that just makes it come across as a weak copy of Muscippa / Utsubot / Naetle / any other pokemon that assaults its trainer. The sense of déjà vu is strong here. With that said, I don't hate the little guy. I just hate how everyone puts it up on this freakin' pedestal. Anyway, I thought this was a pretty decent episode. The parts with Jun were the highlight (as usual), but Potchama being hit by the Meteor Swarm was great as well. I'm not a huge fan of this series' various running jokes, but for some reason I really like this one. I also really enjoyed the animation in this one, because even though it wasn't as great as the last episode, it still managed to give us some great expressions that go above what this show usually does. The scenes at the beginning of the episode with the ellipses and sweatdrop marks make me glad that TPCI is dubbing this show now. If 4Kids was still running things, those ellipses would have been painted out (they've done it plenty of times on their other shows) and they would have had their music blaring throughout the whole damn thing. TPCI, on the other hand, left all that in and didn't have any music playing, and it makes a huge difference. Pretty much all of the Rocket-Dan's dialogue said when they're blasting off is rewritten for the dub. Meowth: "That jerk has got ostentatious-itis!" Meowth: "It's where you're so stuck up, you're sick." James: "Say! Perhaps ostentatious-itis is the very affliction that may teach one of us how not to behave in the future." Jessie: "Ah, how I love learning. As long as it's not me being taught!" Team Rocket: "Well we're blasting off again~!" Originally, Nyasu and the others are going over the various ways he expressed surprise during Fukamaru's assault. They range from being startled to freaked out - nyanto ("what nya? "), nyanda ("what in the - nya? "), and nyan desuto ("what the heck nya?"). The first one (nyanto) is used when Fukamaru first appears in front of their mecha, the second one (nyanda) is used when Fukamaru starts eating it, and the third one (nyandesuto) is used when the disembodied cockpit lands on the ground with Musashi, Kojirou, and Nyasu still sitting in it. As the conversation ends, Musashi brings up the fact that what they're talking about doesn't have anything to do with anything. As you can see, the dub changes all of this in favor of a speech that contains a word that I doubt the majority of the viewing audience (nor Meowth, apparently) is familiar with. Meowth's equivalent lines in the dub were "Who dat?," "Quit munchin' the merchandise!," and "Taste good?," so TPCI would have had to rewrite those as well in order for the speech present in the Japanese version to make any sense. I also have a bit of an issue with the dub making Jessie out to hate learning, especially since we saw her spend an entire episode taking notes at Dawn's and Zoey's battle not two episodes ago. First off, did Officer Jenny's voice change? Or have I just not been watching the TPCI dub in so long that I forgot what their version of the character sounds like? Also, I wanted to say that the music TPCI has playing when Ash and Barry are comparing how many badges they have is atrocious. Who in the world would look at that comical scene and conclude that that music would be the best choice? Finally, Sakaki running away from the giant ball of garbage instantly made me think of Katamari Damacy. And that makes me laugh. James: "We'll go green and be rolling in green while the twerps are green with envy!" Originally, there's a pun here involving a pokemon's name. In Japanese, the word for "ecology" is eko (エコ), which sounds a lot like the name of the pokemon Eneko (エネコ). So here, Kojirou tells us that this is the era of ecology and that it shouldn't be confused as the era of Eneko. Since the pun wouldn't have worked in English, TPCI made up their own pun. Musashi: "Naa, Pika? no koe o kiki"
Kojirou: "Hikari no hayasa de yatte kita"
Musashi: "Sekai ni todoke yo ekorojii!" Kojirou: "Uchuu ni tsutae yo ondanka!" Musashi: "Kowareta meka demo naoshite tsukaeba"
Kojirou: "Mirai ni yasashii risaikuru"
Musashi: "Jidai no shuyaku wa ekoroji!" Musashi: "When we hear a voice saying "Ah, Pika?"" Kojirou: "We show up at the speed of light." Musashi: "The word "ecology" is received by the world!" Kojirou: "The word "climate change" is transmitted to outer space!" Musashi: "If you fix a broken mecha and reuse it,"
Kojirou: "It's good for the future to recycle"
Musashi: "This era belongs to ecology!" Kojirou: "We are the totally up-to-date"
Jessie: "You don't listen so well yourself,"
James: "So we showed up to put you on the shelf." Jessie: "Bringing chaos at a breakneck pace." James: "Dashing hope, putting fear in its place." Jessie: "You ruined our robot, and now you must pay." James: "We've turned things around and recycled our day." Meowth: "Meowth, that's a name!" Jessie: "Beating do-gooders while going green." James: "Because we're Team Rocket,"
The echo effect the dub puts on Team Rocket when they're in their mecha makes it really hard to figure out what they're saying, so I really don't know what that last line is supposed to be. Team Rocket's speech when they blast off for the second time is rewritten just like it was at the beginning of the episode. Here, the nyanto, nyanda, and nyandesuto all occur while Musashi and Kojirou tell him about how they skimped on the repairs for the mecha. Ash: "Barry, I was trying to catch it when you showed up, see?" Originally, Satoshi tells Jun that he had already caught it. The dubbed version makes it sound like Ash is telling Barry that he hadn't caught it yet, which is kind of a weird and out-of-character thing for him to do since Ash doesn't tend to lie to people like that.